Laptops are everywhere, and quite frankly taken over how we work. In fact, I am writing this very review on a laptop, in a bus, travelling between London and Oxford. It is raining outside, but I am happily typing away. But what if you wanted a laptop or a tablet that would do in the rain? A few solutions have been put forward by manufacturers over the years, and luckily the advancement in technology means they have only got better. 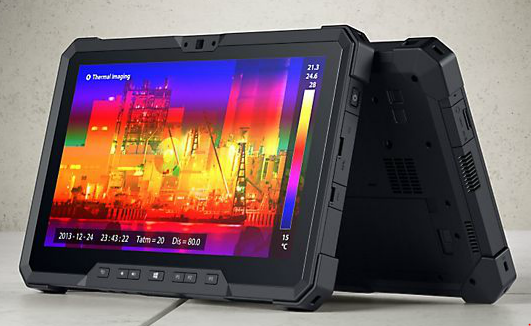 The Latitude 12 Rugged Tablet is one such offering from Dell, and with IP 65 rating, a screen that is both visible in direct sunlight and happy with gloves, and the ability to withstand all sorts of falls and bumps, this ticks all sorts of outdoor and bad environment boxes. In our review, we have a further look at the rugged tablet. To be fair, this looks tough. In fact, it looks very similar to those extra tough phone or tablet cases you get, which come with extra padding all around them, allowing you to drop your device as many times as you like, and subject it to everything from showers to sand storms. 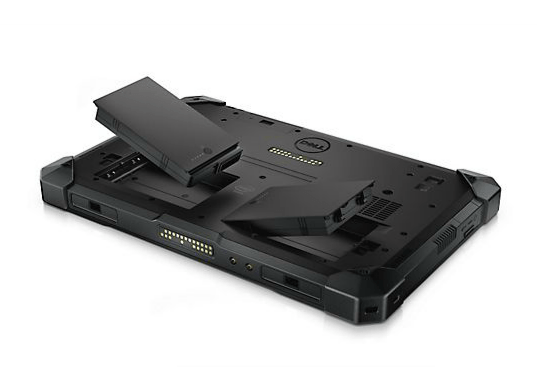 While most of those phone cases don’t expect you to actually subject the phone to all those things on a regular basis, the Latitude 12 Rugged Tablet actually does. In fact, it wants you to work in the desert, run up in the snow, hang out in a rain shower, and then return to bed in the desert heat. The front features the 11.6″ screen, and a few buttons that can be programmed for various apps. You also have a camera at the front. The sides feature various ports, that have certified covers on them which means it should be water and dust proof. You also have the power button on the back. The back features various slots for items such as batteries and HDD, as well as a camera and a fingerprint scanner. Unlike a regular IP65 rated device, you have plenty of venting ports around. At various points you have pads which can be used by various docks. As far as weight goes, it is definitely on the bulky side, and is not really that easy to carry. Keeping also in mind that this comes without any keyboard or mouse, which means you will also have some extra weight if you need those items, though the on screen keyboard works reasonably well. I dropped it a few times, just to check. This was started accidentally by it slipping off the sofa, all the way to me doing constant drop tests. It passed, and there were no damages to speak of. The screen is really good. While not full HD, and sticking with the more usual 1368 x 768 pixel, it is very impressive in terms of sun light use, as well as being able to use it with gloves as well. This made it ideal for outdoor use, and while the worst that happens in my house is a bit of gardening, it was fun to ‘check gardening facts’ as I struggled with my rose bushes. The performance of the device is dependant on what you get. Dell have packed in an Intel M Core processor, instead of the i3/i5/i7 range, which means that it is not the most powerful device, but designed to run and cool and longer instead. This meant that if you are running any heavy duty CAD programs on your device, this will struggle a bit, but most things such as browsing, reading, and general usage, it should be absolutely fine. Interestingly, it runs fairly cool. This is thanks to a fan packed in which I was surprised to hear. It is designed to keep the heat away from all the vital components, and manages to do that while all of them are already packed in a water tight seal. Well done, Dell! It promises 4-6 hours of battery life, and to be honest, it did not disappoint. It works very well, and with the two cell option that I was sent, it was very happy to deliver me 10-12 hours. Just for fun, as I often do, I travelled with this a few times. I tried to use it in coffee shops, and for general reading. The rugged nature of the device makes it a bit unnecessary, and the weight and bulk is bit of a drag. None of this is a surprise though, but I just wanted to check if I could fit this device in every day life. The short answer is no. The long answer is probably. The correct answer is that if you are reading this review, and you have got this far, you probably need a rugged device, and this should definitely fit your bill. It retails from £1369, and optional docks etc can be bought directly from the website too. A specialist device for specialist needs. This ticks all the boxes, and brings with it all kinds of protection and safety. Not one for your average Joe, but outdoor adventurous Dave will definitely love this!